Mohamed Ebrahim Husain is a 24-year-old Bahraini who was a security guard for a private company. The Bahraini authorities have arrested him on numerous occasions, threatened him, subjected him to torture, and convicted him in unfair trials. He remains in Jau Prison, where the authorities have ignored and neglected his medical needs. Mohamed was first arrested by officers in civilian clothing on 13 March 2011 and charged with setting a tent on fire during demonstrations and protests. He was sentenced in absentia to six months’ imprisonment and released on 13 February 2012. His second arrest was also conducted by officers in civilian clothing on 26 November 2012 after a raid on his house, on the charge of attacking Sitra police station. Arresting officers beat Mohamed, particularly on the head, and subjected him to an enforced disappearance for a week. Mohamed reported that he was tortured and severely beaten, and officials targeted his ears. Mohamed refused to participate in court proceedings, as he does not trust the judicial system, and was sentenced in absentia to three years in prison. His lawyer was also not informed of court proceedings, and did not attend. He was released on 11 May 2015. On 2 October 2017, Mohamed suffered a fractured skull and neck, numerous injuries to the body, and fell into a coma due to a car accident. Three days after Mohamed was admitted to the hospital following his car accident, Bahraini officers wearing uniforms and others dressed in civilian clothes came to arrest him, without stating the reason, but when they found Mohamed in a coma the officers left without making an arrest. Roughly a week later, Mohamed was released from the hospital and was able to return home. His condition remained critical and he needed regular care and attention, which prevented him from leaving the house due to his poor cognitive ability. Shortly after Mohamed returned home, officers came to question him. Despite his condition, the officers interrogated him in the house and tried to pressure him to work as an informant. At this point, the officers did not inform Mohamed that there were any criminal charges against him. About a month later, while Mohamed was traveling to Saudi Arabia, he was arrested at the King Fahd Causeway by plain-clothed forces. He was detained for around four hours and interrogated. Again, the officers asked Mohamed to work as an informant and he refused. When he returned home he began to receive calls and threats that authorities would imprison him and bring charges against him if he did not cooperate. On 20 March 2018, officers in plain clothing, National Security Agency (NSA) officers, and Special Security Force Command officers arrested Mohamed in Wadyan village in a security operation. The officers did not present a warrant or any other official document, nor did they mention the reason for the arrest. Officers disappeared Mohamed for five days at the Criminal Investigations Directorate (CID), during which CID officers interrogated Mohamed, tortured him, and charged him with participating in a car bombing in the Sitra area. They subjected him to physical beatings and electric shocks to coerce a confession out of him. They also subjected him to humiliating and degrading treatment. On 27 March 2018, Mohamed was transferred to Jau Prison. Mohamed was unable to continue his medical treatment for the injuries sustained from the car accident while in detention, despite his lawyer providing the necessary medical reports. Further, the torture Mohamed was subjected to by Bahraini authorities worsened his injuries from the car accident, resulting in an inability to concentrate, headaches, and pain in his back. On 10 September 2018, Mohamed was transferred to the Bahrain Defense Force (BDF) military hospital. He had been requesting to be taken to the hospital since he was first brought to the prison, almost six months earlier. However, he was only given painkillers at the hospital and referred to the Salmaniya Medical Complex to undergo spinal surgery, which has not yet occurred. On 29 November 2018, Mohamed was sentenced to three years’ imprisonment for fleeing the country, in relation to when he was traveling to Saudi Arabia, even though he did not have knowledge of any charges against him at the time. On 25 February 2019, the Court of Appeal upheld the sentence. Furthermore, on an unknown date Mohamed was sentenced to 10 years’ imprisonment in the car explosion case, though there was no evidence against him except for the confession of a minor which was coerced through torture. Neither he nor his lawyer was notified about this case and he was sentenced in absentia. On 25 December 2018, the 10-year sentence was reduced to seven years on appeal. On 27 December 2018, Mohamed was sentenced to a further seven years in prison and denationalized on the charge of joining the “February 14 Coalition” (an informal and mostly online group that the Bahraini Government has designated a terrorist organization). Bahrain’s torture, arbitrary arrest, detention, denial of medical care, and unfair trials of Mohamed are in violation of his fundamental human rights and Bahrain’s international and domestic obligations. The detaining forces never offered a warrant to arrest him, in violation of the Bahraini constitution. Furthermore, Mohamed’s torture to coerce a confession out of him is in violation of the Convention Against Torture and Other Cruel, Inhuman or Degrading Treatment or Punishment (CAT) to which Bahrain is a party. In addition, his denial of medical care is in violation of Article 12 of the International Covenant on Economic, Social, and Cultural Rights (ICESCR). 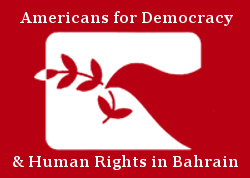 Therefore, Americans for Democracy & Human Rights in Bahrain (ADHRB) calls for Mohamed’s release with redress for past suffering and, if serious criminal charges can be sustained against him, for a fair trial conducted under universally agreed juridical standards and open to international monitoring and evaluation.